A housewarming party is a great way to welcome friends and family to their new home or new neighbors to your neighborhood. It can be hosted by the new homeowner or by an outsider on behalf of the new homeowner. What guests bring to a housewarming depends on how well they know the homeowner and their own personal taste in gifts. Carefully choose the gift you bring to welcome a new neighbor or wish someone luck in his new home. For a gift to welcome a new neighbor to your community whose style is not familiar to you, consider a gift basket with generic items. Make your own basket arrangement with simple items available in grocery and home improvement stores. Include generic kitchen and bath items, such as linens, soap dispensers and glasses. 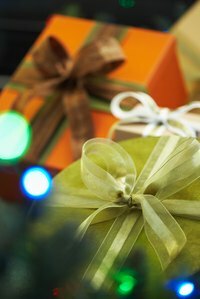 For a extra helpful gift, add a list of local stores, restaurants and service companies, including lawn care, plumbing, electrical and general home repair companies that you can recommend. Include a gift certificate for a favorite restaurant or movie tickets for a night out. Bring an eco-friendly gift to help the new homeowner go green. Kitchen accessories and household linens made from organically grown bamboo are durable and practical, as well as fashionable. Present a native tree with a balled root to plant and nurture in the new home. Give live plants to add to the landscape along with a note offering some time to help plant them. For the eco-friendly chef, a tabletop composter gets a new house off to a good start on composting and recycling. For the homeowner who has moved into his first home, gifts to use outdoors are often the most practical and appreciated. Select gardening tools, such as a rake, hoe and shovel. Add work or gardening gloves and use a watering can to hold small hand tools. If the homeowners are in a different climate than they previously lived in, consider a gift appropriate to the new climate, such as beach equipment, snow shovels or items specific to any outdoor sport they may enjoy in their new location. Every new homeowner could use a little extra cash. Instead of an envelope with an impersonal gift card or cash stuffed in it, make unique money gifts with bills of different denominations, using origami-folding techniques. Add the folded bills to another item for a two-fold gift. Create bows and butterflies to hang on a potted tree or plant. Make flower bouquets to place in a vase. Fold bills into baskets or boxes to hold small gifts, such as restaurant gift cards or a decorative new key ring.